Zen Meditation Class: Monthly meditation class will be offered in a 4 week session starting in 2019. Watch for dates and/or email info@carolscaninetraining.com to get on the waiting list! Voted #1 Dog Trainer in Milwaukee Journal’s Top Choice Awards for the Greater Milwaukee area. Certified Meditation Teacher – New Class-Dog Meditation! Phone advice/consultations for aggression, behavior problems & training issues in the privacy of your own home. *I am one of only 4 IAABC consultants in the state of Wisconsin. The certification requirements for the International Association of Animal Behavior Consultants includes hundreds of hours of behavior consulting work and coursework, seminars, mentorships and case studies. Consultations must also possess a working knowledge of learning theory, counter-conditioning, desensitization, training and husbandry, with additional in-depth knowledge of assessment skills and application of species specific knowledge. You got a dog to bring joy to your life. Dogs training doesn’t have to be complicated. Dogs are very good at being dogs. It’s up to us to show them a better way to exist in our world through training. As an Associate Certified Behavior Consultant and a Certified Dog Trainer with over 20 years of experience, I’ll show you fun, easy and effective training methods that work. From basic manners/training to behavioral issues/aggression, I have experience with all! I one of only 4 behavior professionals certified by the International Association of Animal Behavior Consultants in the state of Wisconsin. I’m also a Certified Professional Dog Trainer, with the Council of Professional Dog Trainers. I am an evaluator for The Alliance of Therapy Dogs, an organization dedicated to the work of therapy dogs in senior facilities and schools. I do Behavior Assessments, Treatment Plans and Training Protocols for dogs who exhibit problem or inappropriate behaviors due to past neglect, temperament, lack of socialization, training or mental health issues such as aggression, anxiety, fear, reactivity or phobias. I also do classes and private training to help clients raise a great dog or and bond and build their relationship. Phone consultations available for basics like housetraining, jumping, leash work and basic manners and for behavioral problems including aggression, resource guarding, anxiety and more. I use a common sense approach that utilizes minimal time and effort while building a positive relationship between you and your dog. 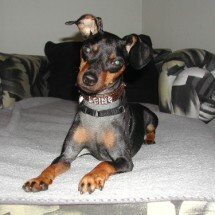 I understand you are busy so I can help you make the best use of your time while enriching your dog’s life. I train using force-free, science-based methods that work! I’m all about good leadership which is built on a trusting, positive relationship with your dog. My methods are fun and easy, for both you and your dog. Dog training doesn’t have to be difficult or boring! Contact me to learn more today! 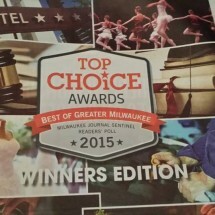 Voted #1 Dog Trainer in Milwaukee Journal Top Choice Awards. Located in Waukesha, WI and serve clients in the Waukesha country greater Milwaukee area. I live what I teach. Having worked at a shelter for almost a decade and have fostered/rehabilitated 100's of challenging dogs to prepare them for adoption. I have worked with various non-profit animal rescue organizations, fostering, consulting and training for over 2 decades. I have always exclusively chosen to share my home with shelter or rescue dogs. Two of my dogs, one of which was rescued from a puppymill auction, were so scared of life they were deemed unadoptable. After building up their confidence, both are demo dogs in my classes as well as therapy dogs. 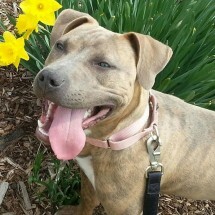 Dogs who resource guard, have dog/dog issues, or are leash reactive. 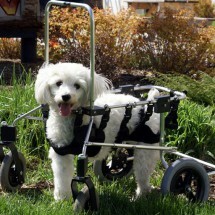 Shy, skittish, and puppymill rescues who have trouble adjusting to living in a home. Adolescent, boisterous dogs who need manners and impulse control. Through many years of working with animal rescue organizations, shelters and clients, I have extensive experience with all dog behavioral issues. I don't just study the methods, I share my home with dogs who had no other options and almost always have a foster in need of special training help and behavior modification.